All young children are naturally curious about everything that surrounds them and they like to explore. They will put just about anything in their mouths as part of the learning experience. They are then particularly vulnerable to all sorts of hazards, pet dangers, choking, including accidental poisoning from everyday household products. The majority of accidental poisonings occur with children under the age of 5 and nearly 90% of all poisonings occur in the home. 40% of poisonings are caused by medicines and the remaining causes are cosmetics, cleaning products, toys, art and craft materials, alcohol and other household chemicals.Colored pills and tablets are especially tempting to a child confusing them with sweets. Even vitamin tablets and iron pills may present a danger to a young child. Since the recent tradegy in America of the four year old who died swallowing a lead laced charm the government advices parents not to leave any metallic costume jewelry around young children. The object came with a new pair of sports shoes. Identify poisonous garden plants, shrubs and trees to ensure your garden is clear to avoid children picking poisonous berries. Also, teach your children which plants are dangerous and which can help. Avoid taking medicines and pills in front of a child. Don't leave a child unattended with household chemicals around. Answer the front door or telephone by taking your child with you. It only takes seconds for an poisoning accident to occur. Children and chemicals can be fast acting. Do not mix household chemicals. Mixing ammonia products with other chemicals can produce very dangerous results. Keep all toxic and dangerous materials, chemicals and harmful substances well out of reach, and if possible, locked away. 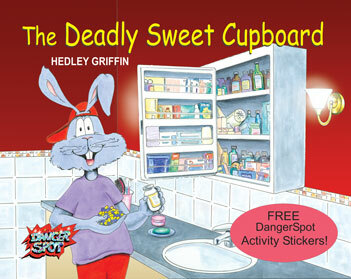 It is also a good idea to identify particularly dangerous substances to be stored furthest out of reach. Bare in mind that a toddler might climb and be quite ingenious at finding those colourful, alluring “drinks” and “sweets”. Some household liquids are kept in colourful, fruit imitating bottles, which could also attract an unwary young child. Never keep any poisonous chemicals or dangerous materials in a milk bottle or glass, which a child might think was a drink. Recently a 2-year-old child was taken to hospital after drinking a small amount of bleach, a very common accident. This particular case happened when the mother put some bleach in a cup and left it available for the child to drink. Very often, most childhood poisonings occur when an adult is using a poisonous product. Child resistant lids are not any help because they are often left off or not secured properly while the material is being used, making it accessible for an inquisitive child. If your child is a victim of poisoning of this nature, call 999 and ask for an ambulance. It is always better to risk upsetting the local NHS with an unnecessary alarm than risk the life of a child. Try to establish what the child has taken and the quantity. Keep the article or bottle safe and give it to the paramedics or hospital staff, and give them as much information as you can. Unless instructed by a medical professional, do not try to induce vomiting. This could make matters worse. Should a child be sick, collect the vomit for the medical staff to help identify the poison if it is unknown.